Adrift in space with no food or water, Tony Stark sends a message to Pepper Potts as his oxygen supply starts to dwindle. Meanwhile, the remaining Avengers — Thor, Black Widow, Captain America and Bruce Banner — must figure out a way to bring back their vanquished allies for an epic showdown with Thanos — the evil demigod who decimated the planet and the universe. KIDS FIRST! Film Critic Katherine S. comments, “This movie takes you on an epic, wild ride filled with action, laughter, love, heartache and tears. 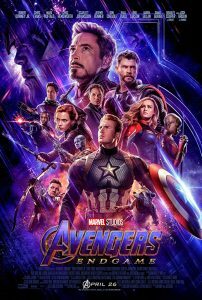 As a superhero lover, there is nothing more thrilling than watching this movie – all three hours of it.” Zoe C. adds, “Avengers: Endgame is the epic conclusion of 11 years of films from the Marvel Cinematic Universe (MCU) and is nothing less but spectacular! It is a constellation of the biggest Hollywood stars in one event that is entertaining, heartfelt and fun at the same time.” KIDS FIRST! 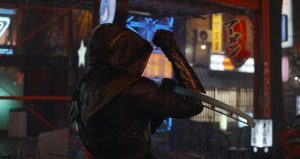 Adult reviewer wraps it up with, “. I’m not going to lie, Avengers: Endgame, the 22nd film release from Marvel, is a cinematic roller coaster ride for everyone. I laughed. I cried. I loved every pop culture reference. Let us remember, I am not the target audience and I can’t wait to see it again.” See their full reviews below. Can you say “epic”? This movie takes you on an epic, wild ride filled with action, laughter, love, heartache and tears. As a superhero lover, there is nothing more thrilling than watching this movie – all three hours of it. Bringing all of the Marvel characters together in one movie is simply brilliant. 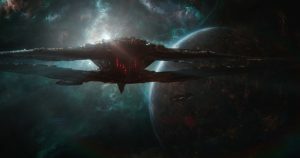 Avengers: Endgame is based on an awesome journey, post Thanos destruction, of half the Universe. The Avengers are not used to losing, as they did when we last watched them together, so, they come up with a plan to finally defeat Thanos and save the Universe. If you haven’t seen many Marvel movies, I recommend watching all of them – each worthy of a 4- or 5-star rating. 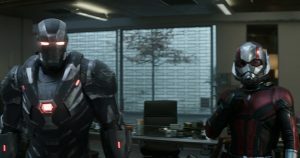 In Avengers: Endgame, we see many of the same characters as in other Avenger films. Tony Stark (aka Ironman), played by Robert Downey Jr., and Steve Rogers (aka Captain America), played by Chris Evans, are probably on the screen the most. The special effects are out of this world. The sound effects make the theatre seats rattle, and the new costumes are super sleek. My favorite character is Rocket because he is a funny, outspoken, genetically-engineered, spaceship-flying raccoon. My favorite scene is when Thor appears in a way we have never seen him before, and it made me laugh out loud. 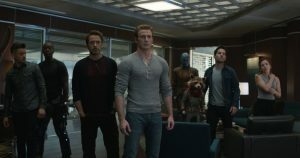 The message of Avengers: Endgame is about the characters’ hunger for the old days, teamwork and determination. Without the team and their determination, they are nothing. Together they are able to be good and do good. Be aware that this movie has some mild profanity, intense violence (stabbings, decapitation, sliced throat, impalement, explosions), alcohol drinking and other risky behavior that kids might replicate. I give this movie a 5 out of 5 stars and recommend this for ages 10 to 18, and for adults, for sure. Avengers: Endgame is in theaters on April 26, 2019. 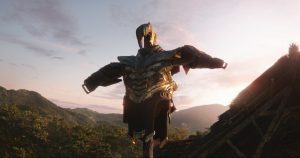 Avengers: Endgame is the epic conclusion of 11 years of films from the Marvel Cinematic Universe (MCU) and is nothing less but spectacular! It is a constellation of the biggest Hollywood stars in one event that is entertaining, heartfelt and fun at the same time. The basic premise is: the remaining super heroes from the previous film Avengers: Infinity War fight together against evil Thanos to restore peace based on their faith on humankind. The story develops in three acts. Act 1 is very dramatic and gives the actors the opportunity to develop their characters in scenes that are not action related. We see the most human side of these heroes here. This Avengers film has the best acting of all. Among my favorites performers are Robert Downey Jr. who plays Iron Man and steals the show. Chris Evans, as Captain America, carries the spirit of the team and is always very enthusiastic. Brie Larson brings a lot of gravitas. I can’t mention other favorites, because it would be a spoiler. In this act the Avengers reflect about what might happen if they could turn back time and do things differently. We see how these characters react to loss and hope. In Act 2 we see the action plan. The movie deals with the concept of time travel and references a lot of films also developed around concepts of present, past and future. During this act, the movie gets a little slow, despite the fun and dramatic action scenes. There are flashbacks and you need to follow carefully to figure out what happens. Even though this film’s run time is three hours, it’s necessary to fit everything in needed to develop the story. The finale is a total extravaganza and makes this film a unique and total experience. The special affects are fantastic, especially in the Act 3 when we see most of the action scenes and intense battles. The music is very orchestral, but of course it includes contemporary pop and rock songs. There are so many surprises that make the whole experience very enjoyable. There are also so many details and, although you don’t need to see the previous films to enjoy this one, there is a lot that is directly connected with the previous films, specifically Avengers: Infinity War. The message of this film is: the world is in our hands and we have to do something to preserve it. We can have a second chance as long as we want to accomplish something. 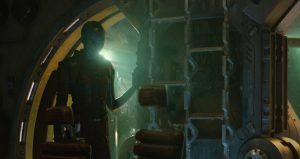 This is part of the beauty of Avengers: Endgame – a lot messages will resonate and touch you like no other super heroes movie does. I am very sad this is the last film, so there will not be another one like this one. 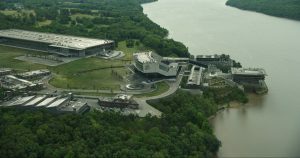 I recommend Avengers: Endgame to ages 10 to 18. This is not as violent as Infinity War, but obviously parental guidance is important younger viewers. Avengers: Endgame opens nationwide on April 26, 2019. Look for it! The Marvel Cinematic Universe (MCU) is in full force, as is the promotion for what is expected to be a record-breaking film release. I’m not going to lie, Avengers: Endgame, the 22nd film release from Marvel, is a cinematic roller coaster ride for everyone. I laughed. I cried. I loved every pop culture reference. Let us remember, I am not the target audience and I can’t wait to see it again. As in past MCU films, the Avengers are a tight group of superheroes who are like a family and showcase the heart of family throughout time in this film. At the end of Avengers: Infinity Wars, the snap heard throughout the universe ended lives and destroyed families like nothing before. How Thanos (Josh Brolin), the villain, could win vs. our super heroes stymied many. The end credit scenes in Captain Marvel (Brie Larson), gave us a bit of a hint about who would live to save the day, but what would bring our heroes together? Again, it’s Thanos. The use of time and space is a creative set-up for this film and, without delivering spoilers, it truly has to be seen to be believed. There is a great historical thread and deep family themes throughout the film. In many ways, it is funnier than the Guardians of the Galaxy films, too. There is a single frame in the film screaming girl power, and we learn more about the back story of many characters including Captain America (Chris Evans), Iron Man (Robert Downey, Jr.) and Thor (Chris Hemsworth). The film is an epic conclusion to a well-told story over the last ten years. Note. This film is a full three hours long. Avoid the over-sized soft drinks or you will miss the action scenes within the film. You simply must see every frame within the last hour. If you don’t have the “Run Pee” app, now is a good time to download it! I give this film 5 of 5 stars for the casting, costumes, special effects, family themes, humor, awesome comedic pop culture references, make-up (men and women) and female empowerment. This film will appeal to ages 8 to 18. I caution younger viewing due to fight scenes which may be disturbing to younger children. Be sure to look for Stan Lee – it has been confirmed this is his last film appearance. May he rest in eternal peace, protected by the Marvel Universe. When we imagine a post-apocalyptic world, it usually includes a lot of broken down buildings, stray dogs and a bunch of raggedy and tough survivors, but rarely zombies! Warm Bodies, rated PG-13, is a hilarious look at what could be, a world in which humans are uncommon and zombies roam the land looking for fresh bodies to eat. This may not sound appealing, but according to 15-year-old KIDS FIRST! Film Critic, Raven Devanney, it’s actually quite hilarious. A quirky romance/comedy/horror film, it stands to remind us of the true meaning of humanity and the importance of staying connected with others. The newest addition to the Zombie, Romance, Comedy and Horror genre. I call it, a Zombromance, or a Zomedy! It’s set in a post apocalyptic world consisting of zombies, bonies and a small population of humans. When a zombie named R (Nicholas Hoult) meets a Human girl named Julie, he starts to feel like there is more to life than just being the walking dead. He begins to cure himself, retrain himself to talk and become more human. He inspires more zombies to try to cure themselves, and slowly they begin to become more human. Will R and Julie defy the odds and stay together, or will the fact that one of them is a zombie keep them apart? I absolutely adore this movie. I will definitely see it over and over again. When I think of zombie movies I think of nasty rotting creatures and lots of blood and gore. Naturally the zombies eat people in this movie, but it is filmed in such a way that brought a sense of humor to the whole thing and the blood was very minimal. Even the zombies don’t look that bad. In fact, Nicholas Hoult makes one attractive zombie! I like the lighting and sets in this film a lot. You can definitely tell that it is a post apocalyptic world, but the zombies still try to maintain somewhat consistent routines. I thought it was cool too see zombie security guards and janitors. Although they weren’t doing much, you still got the sense that there was some humanity left in them. My favorite character is R because he is such a sweetheart. He goes against his urge to eat people to save Julie and he proves that he is more than just a mindless flesh eater. Even though he is relearning how to speak, he is still quite slow so he can only mutter out simple words and phrases. Nicholas Hoult does a fantastic job keeping this character dull and Zombie-like, while still giving glimpses of his emotions and personality. This movie shows that R still has completely normal thoughts, he just can’t express them, as if he is trapped in his own mind. R voiced over most of the movie and it was hilarious to hear what he was thinking, compared to what he was actually able to do. He made me laugh even in more intense situations, making him my absolute favorite character. I can’t say I have a favorite scene because this whole movie is incredibly well done. I do love all the times that R and his Zombie friend M or “Marcus” interact. They try to communicate and connect and it’s so funny and touching to see their friendship show even though it’s challenging for them to express it. I also really enjoy the seen when Julie (Teresa Palmer) and her friend Nora (Analeigh Tipton) give R a makeover. R is so reluctant to have makeup put on him, which I thought was funny because most teenage boys are. The music in this scene was particularly funny and entertaining and it is a memorable scene. I recommend this film for ages 13 and up because teens and even adults will love this movie, but kids under the age of 13 may find it to be too mature. I give Warm Bodies 10 out of 10 stars so go check it out at a theater near you!